PA leadership announces it will no longer work with Nickolay Mladenov after he sought a deal between Israel and Hamas. The Palestinian Authority (PA) leadership announced on Thursday it will no longer work with UN peace envoy Nickolay Mladenov, accusing him of overstepping his role by seeking a deal between Israel and Hamas, AFP reported. Ahmed Majdalani, a member of the Palestine Liberation Organization's (PLO) executive committee, said it had informed the UN secretary general that Mladenov was "no longer acceptable" to the PA government. 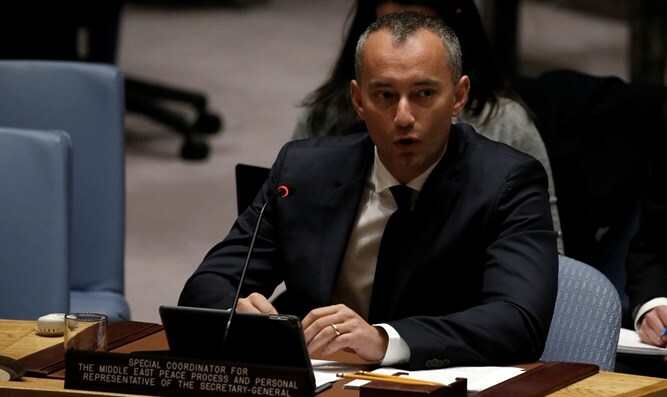 Mladenov had "gone beyond his role" in seeking agreements between Israel and Hamas, which controls Gaza, he charged, adding that his actions impacted "Palestinian national security and the unity of our people." There was no immediate comment from Mladenov or confirmation from the United Nations. In response to the PA’s intent to stop working with Mladenov, Israel's ambassador to the UN, Danny Danon, said that "after the Palestinians said 'no' to Israel and 'no' to the Americans, they are now saying 'no' to the UN as well. In this decision, Abu Mazen is continuing to lead the Palestinian Authority to international isolation, which ultimately harm the Palestinians." Mladenov, alongside Egypt, has been seeking a long-term truce agreement between Hamas and the Jewish state, without including PA chairman Mahmoud Abbas. The PA has repeatedly criticized those talks, with one report indicating Abbas had threatened to cut all contact with Israel, should the Jewish state reach a ceasefire agreement with the Hamas terrorist organization. The talks have stalled, partly due to the pressure from Abbas, but on Tuesday a smaller UN-brokered agreement was reached for Qatar to finance much-needed fuel deliveries to Gaza for six months. Abbas' government was not involved in that deal and Mladenov's strategy has angered PA politicians. Abbas is trying to pressure Gaza's Hamas rulers to return control of Gaza to his Fatah movement, most notably by cutting electricity supplies to Gaza through Israel. He has refused moves to improve the electricity supply in Gaza unless there is progress in the PA-Hamas reconciliation talks. The Hamas-Fatah conflict has been ongoing since 2007, when Hamas violently took control of Gaza from Fatah. Fatah and Hamas signed a reconciliation deal last October, under which the PA was to have resumed full control of Gaza by December 1. That deadline was initially put back by 10 days and had later reportedly hit “obstacles”. Attempts to get the sides back to the negotiating table have failed.